You may or may not have heard by now, but we’re introducing a new managed services pricing model for printing. Rest assured, the previous model we had in place isn’t going anywhere. In this blog, I’ll be explaining this new model and sharing a few examples of how it can impact businesses. Our newest managed services pricing model offers customers the opportunity to pay a flat monthly fee for their print services. This consistent monthly investment includes toner, break fix service, remote help desk support and device replacement. In terms of the services being delivered, nothing has changed. What has changed is the reliance on meter readings. Up until now, our managed print services offering has been reliant on a cost-per-page pricing model. This model required customers to provide meter readings from all local devices four times per year. 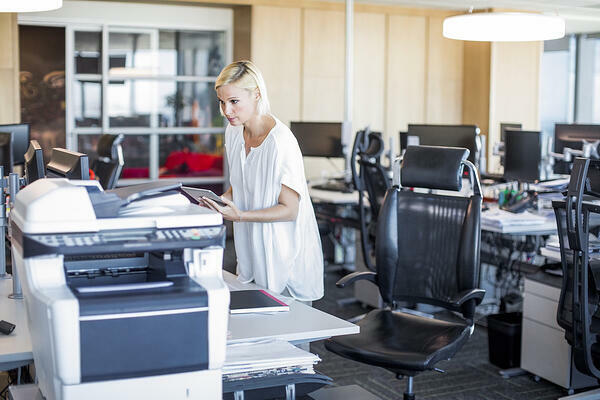 While it might not sound like much to small- or medium-sized businesses with a handful of print devices, keep in mind that we have customers with hundreds of locally-connected print devices too. We decided to add this new, pay per device model to make things a little easier on those customers who are burdened by collecting meter readings and would prefer to pay a consistent monthly investment that isn’t dependent on their print volume. It saves them time by not having to dedicate internal staff time to collect readings, and it helps them budget more effectively because they always know how much their print costs are going to amount to. There are no overage charges to worry about, and the only way the amount invested in print services will increase is if more devices are required. Who Can Benefit from Cost Per Device Pricing? The biggest determining factor is going to be the number of local printers and copiers your business has. Under the pay-per-print model, each device that’s not tied to the network requires meter readings to be collected and reported back to us at Marco. Here’s a look at two scenarios where paying per device is likely the better option. Consider a hospital with 1,000 print devices. 750 of them are on the network, and 250 of them are locally-connected exam room printers. Four times a year, a staff member (or multiple staff members) need to collect a meter reading from each of the 250 network printers and relay those meter readings back to their managed print provider. Then, the hospital is invoiced based upon their print volume, which will vary from quarter to quarter. Now, consider a school district where each teacher has a network-connected device in their classroom. Teachers are asked to provide their meter readings. Because they are overburdened with day-to-day requirements in addition to teaching students, meter readings fall to the back burner. It then becomes the burden of the district’s IT director to remind teachers to turn in their meter readings or physically go classroom to classroom to collect the readings themselves. Once meter readings are shared with their managed print provider, they are invoiced according to print volume. In a district with tight budgetary restrictions, dealing with inconsistent print invoicing can add additional difficulty. Is Marco’s New Managed Services Pricing Right for You? This new pricing model isn’t for every business, but it is a good model for the right customer. And having both models means we can offer the best option based on each customer’s environment. If you’re on the fence about whether or not paying per device would work best for your print environment, you don’t need to worry. As a managed print provider, we’re well-versed in assessing print environments and determining the best solution based on any and all present variables. Undergoing a print audit is all it takes to uncover which pricing model is right for your business, plus so much more.